You spent plenty of hours working on your mobile site, getting it just right, only to discover Google is penalizing both your mobile and desktop sites because of coding issues that flags duplicate content. While Google is generally good about recognizing the difference between mobile and desktop sites, it is entirely possible to encounter some bad search engine optimization issues with multiple versions of the same site. One way some designers are getting around this is through the use of responsive design, which uses a single design that adapts to the display of the device accessing it. Responsive web design isn’t just a trendy buzzword. It’s incredibly useful technology that can reduce your web design budget. For example, Malleck Design mentions the up-front money-saving aspects, since designing a single set of code takes a smaller chunk out of your budget than designing two or three. Your overall conversions will also increase, due to the unified browsing look as you go from device to device. It looks more professional than a mobile site that is completely different than what the customer is normally used to browsing around on their home or work PC. In a perfect world, the Google bot will see a mobile site and understand this content is associated with the site, but it is only duplicating the content out of necessity, as opposed to an attempt to game the system. However, sometimes Google Bot doesn’t recognize a site is supposed to be mobile-only and may incorrectly assume that there is a duplicate content issue. Responsive design cannot have this problem since it only uses the user agent to change its display through each design element, instead of presenting a completely different web page entirely. Many people own a tablet, smartphone and PC, and use all three devices for their web browsing behavior. Users used to search for WiFi hotspots to go online, now they like to see the 4G coverage map on their mobile phones. 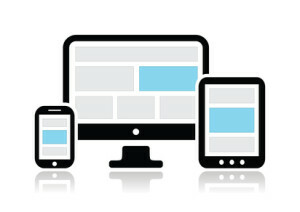 Responsive design adapts to the way people are using the Internet by adjusting to the platform. When your customers know they can access your site anytime, anywhere, and on any device they want, and the experience is mostly identical across all of the platforms, they’re going to have a much better time. The mobile market, particularly in the tablet sector, is continuing to grow at a rapid pace. This year, tablet shipments are expected to grow almost 70 percent compared to last year, Gartner reports, so getting your responsive design in place now is a good way of future-proofing your website.